(Nanowerk Spotlight) One of the most common methods of film manufacture is Blown Film Extrusion. The process, by which most commodity and specialized plastic films are made for the packaging industry, involves extrusion of a plastic through a circular die, followed by "bubble-like" expansion. The resulting thin tubular film can be used directly, or slit to form a flat film. Nanoscientists now have found a way to use this very common and efficient industrial technology to potentially solve the problem of fabricating large-area nanocomposite films. Currently, the problems with making thin film assemblies are either the production cost of using complex techniques like wet spinning or the unsatisfactory results of unevenly distributed and lumping nanoparticles within the film. The new bubble film technique results in well-aligned and controlled-density nanowire and carbon nanotubes (CNTs) films over large areas. These findings could finally open the door to affordable and reliable large-scale assembly of nanostructures. "Our findings demonstrate a method – applicable to all nanotube and nanowire materials – to produce uniform, aligned structures on a size scale several orders of magnitude larger than achieved previously – and moreover with much larger sizes possible" Dr. Charles Lieber explains to Nanowerk. "The main motivation of this work was to develop a highly flexible and scalable approach to assemble uniform, aligned arrays of nanowires and nanotubes to open up possible applications in, for example, biological sensors and displays." "The key finding in our work is that homogeneous polymer suspensions of one-dimensional nanomaterials (CNTs and nanowires) can expanded into bubbles – much like a simple soap bubble – in which the nanotubes and nanowires are uniformly aligned along the bubble expansion (longitudinal) direction with a density tuned by the solution concentration" adds Dr. Anyuan Cao. "Controlled assembly of these nanomaterials has been a bottleneck for many potential applications, especially for micro- and nanoelectronic systems where regular distribution of aligned nanotubes or nanowires is required." Lieber, the Mark Hyman Professor of Chemistry, and a professor at the School of Engineering and Applied Sciences at Harvard University, Cao, an assistant professor in Mechanical Engineering at the University of Hawaii at Manoa, and Guihua Yu from the Department of Chemistry and Chemical Biology at Harvard, the first author, published a recent paper in Nature Nanotechnology about their findings ("Large-area blown bubble films of aligned nanowires and carbon nanotubes"). Previously, researchers have developed methods to produce aligned materials but only on a centimeter scale or smaller. Here, the team have demonstrated aligned films of nanowires and nanotubes orders of magnitude larger in scale, and in fact on a scale relevant to many commercial applications. While blown film extrusion is a well established technique in industry, this is the first time nanomaterials were introduced into polymers and blown bubbles with uniform distribution and alignment. The new technique represents a real breakthrough in nanocomposite film fabrication, something researchers have worked on for years but always restricted to a very small scale. In contrast, the new research demonstrates blown bubble films with well-aligned and controlled-density nanowires and CNTs on flexible plastic sheets up to 225 mm x 300 mm, highly curved surfaces, and also suspended across open frames. "We believe that these films should be scalable to much larger meter-scale sizes by controlling the steps of bubble formation and expansion as is currently achieved with homogeneous polymers, and that our approach could be extended to enable three-dimensional structures" says Lieber. "Moreover" says Cao, "our blown bubble film approach can assemble aligned structures on virtually any substrate, thus opening up the way to many unique applications on highly flexible substrates." The approach to creating these bubble films consists of three basic steps: 1) preparation of a homogeneous, stable and controlled concentration polymer suspension of nanowires or CNTs, 2) expansion of the polymer suspension using a circular die to form a bubble at controlled pressure and expansion rate, and 3) transfer of the bubble film to substrates or open frame structures. The films could be transferred to both rigid and flexible substrates during the expansion process. In the present process, relatively low concentrations of CNTs and nanowires, less than 1%, are dispersed in the polymer suspension. As a result, the distance between individual nanostructures is relatively large (greater than 2 µm). "You need at least 4-5% by weight to get a good mechanical structure, but this is quite achievable, for example using surfactants or alternative polymers. There should now be real advances made quickly by learning from other areas" says Lieber. Generally, this technique would allow fabrication of large-area thin film products with all types of nanoscale components. The bubble films could be further processed to make arrays of nanoelectronic or optical devices, sensors, and field emitters for flat panel displays. 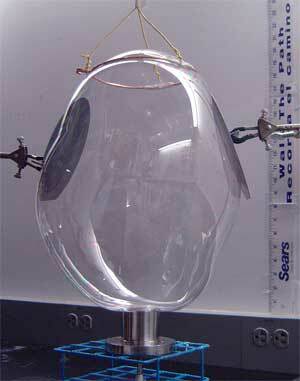 Bubble films coated on plastic substrates could be fabricated into flexible micro/nano systems. Introducing nanomaterials could also produce reinforced plastic films with better mechanical properties. The regular alignment of CNTs within the film would give it high tensile strength, potentially higher than Kevlar, and would make this an intriguing material for many materials applications, from airplane wings to protective clothing and armor. Cao says that the team is now exploring several areas, including fabrication of nanosystems with distinct electrical or optical properties, and use of different polymers to facilitate subsequent device fabrication. "For example, we have developed photopolymer (PMMA) based bubbles that can be directly integrated into modern microfabrication technique to pattern electrodes." He also cautions that there are challenges facing their research in the near future: "A better understanding of the mechanism of nanostructure alignment during bubble blowing process is necessary for further optimizing the process, and materials and instrumentation need to be developed for large scale production."